If you are a fan of Loretta Lynn or classic country music, then there is no doubt that you will LOVE a trip to Loretta Lynn’s Ranch. But if you aren’t a fan, don’t mark this off your list. There is a lot to do at this family fun attraction. Take a look at the offerings before you decide. Located in Hurricane Mills, TN, Loretta Lynn’s Ranch is about an hour west of Nashville.The ranch covers LOTS of territory and has many special events throughout the year. There is a campground located on the ranch that is open all year round. If you aren’t into the idea of ‘roughing it’, there are also cabins available to rent. We stayed in one of the cabins during our trip. They are small but they have two queen beds, a nice bathroom and a small fridge and microwave. They also feature a nice deck on the back. Of course you can always visit the ranch just for the day and pick and choose which activities will fit into your time frame. The Western Town area is where you will find the majority of the tours available. You will need to drive to this area even if you are staying on the property. There is plenty of parking. Start in the shop right out front to purchase your tour. There are two different tours available. Tour #1 includes the plantation home and museum. Tour #2 includes the plantation home, museum, coal mine, and the Butcher Holler home. I would suggest you go with #2. It’s not much more expensive and, to me, going from the small Butcher Holler house to the large plantation home really gives you a glimpse into the life that Loretta Lynn has lived. We began our tour in the main museum. No photography is allowed in this museum. As you enter there is a large room to the left. This space is filled with scenes from Loretta’s life. There are several cars on display and you can go on her old tour bus. Each of these displays is accompanied by a large sign handwritten by Loretta with her description of what you are seeing. On the other side of the museum is a large collection of memorabilia. There are tons of dresses and costumes worn by Loretta and her sister, Crystal Gayle. There is also a huge collection of family photos. You will also be able to see a display of the wedding gowns worn by many of her children and grandchildren. And there are many promotional items from their varied careers in country music. As you continue through the museum, you will see many displays of awards and gold records. The number of trophies and awards is massive. The museum also has a complete replica exhibit of the Butcher Holler school room. If you happen to be a fan of Conway Twitty (and if you aren’t, you should be) the next part of the museum will thrill you. There is an entire room dedicated to an exhibit of Loretta’s late duet partner. This exhibit also features a huge video screen that plays classic footage of Loretta and Conway together. This is a great place to rest for a while. There are several benches in front of the video screen. The official tour begins on the steps of the Grist Mill. The tour group assembles here and then walks across the street to the replica of the Butcher Holler home. There is a large set of steps in order to access the home so keep that in mind. The home is very small and has only four rooms. It’s very hard to imagine the large Lynn family all living in this home but they did. The tour won’t take very long and once you are done the next stop is the coal mine. 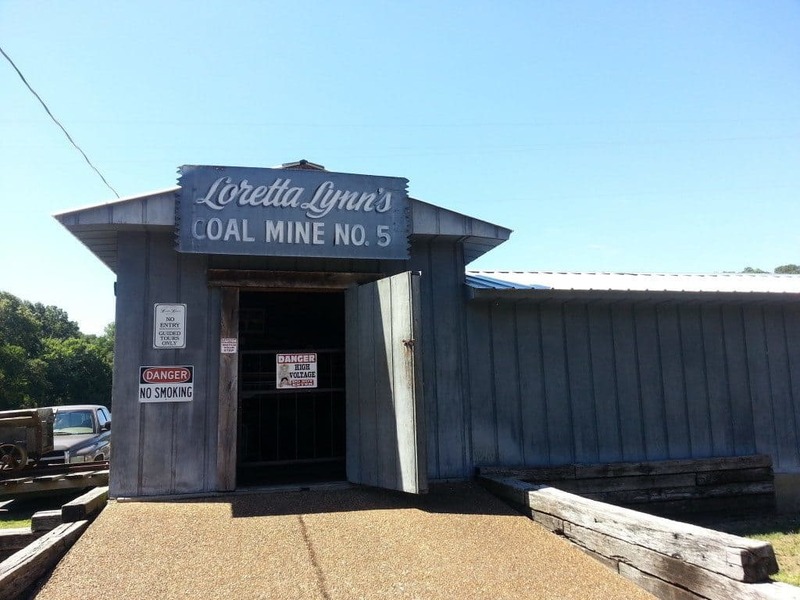 The coal mine is a recreation of the mine where Loretta’s father worked. There are lots of authentic mining tools on display here also. It is quite small so keep that in mind if you have issues being in tight spaces. After the coal mine, you will board a tour bus to travel to the plantation house. It’s a quick trip. The guide will tell you lots of stories about the house. There are even ghost stories. No photography is allowed inside the house. You will get to tour the main level of the home. You will even get to see the kitchen where Loretta filmed those famous Crisco commercials! Once the plantation house tour is over, the tour bus will take you back to the grist mill.This is a really beautiful natural area. Carve out some time to just sit and relax here while you take in the beautiful scenery. In this same area, you will find the Fan and Doll Museum. Basically Loretta’s fans love to make and send her stuff…especially dolls. She had so many that she collected them all into this large room. Take your time touring this deal. You won’t believe all the stuff! There are additional gift shops located throughout this area. There is also a playground, a snack bar, public restrooms and a large picnic area. During the summer months you can canoe, kayak or tube. There is also a large swimming pool on the ranch. Trail rides on horseback , hiking and 4 wheeling are some of the other outdoor fun options available. Consider a trip to the Loretta Lynn Ranch. There are so many things to do and see. And if you aren’t a fan before your trip, chances are good you might be by the time it’s over! Cost for camping, cabins and other activities vary. See website for details.